Provide comfort for the family of Lenora Allen with a meaningful gesture of sympathy. BENJAMIN FUNERAL SERVICES NOWATA, OKLAHOMA 918-273-2700...………..Lenora Jean Allen, 59, died on February 6, 2019 peacefully at her residence in Bartlesville, Oklahoma. Lenora was born in Nowata, Oklahoma to Jessie James Allen and Barbara Jean (Ginger) Allen. Lenora lived in Delaware, Oklahoma and attended school there. She had lived in Michigan then came back a short time later, then moved to Bartlesville, Oklahoma where she made her home till her passing. She attended Humble Road Church. She enjoyed ceramics and painting from time to time. She also liked Antique Glass, her other hobbies included sketching and reading. She was an excellent seamstress as well as her family saying she had remarkable cooking skills. She was known for her big heart and doing so much for others not thinking of herself at times. She is survived by her mother Barbara Jean (Ginger) Allen; sons, Ronnie Robertson and wife Olivia of California, there children are Misha, Levi, Jedidiah, Gloria Robertson and Dale Allen of Bartlesville, Oklahoma; sisters, Betty Alspach of Nowata, Oklahoma; Ginger Noblitt of Claremore, Oklahoma; Linda Koscelny and husband Kenny of Delaware, Oklahoma; brothers, Danny Allen of Delaware, Oklahoma; David Allen and Billy Jack Allen both of Nowata, Oklahoma; Steve Allen of Dewey, Oklahoma. Lenora will be missed by all that knew her. 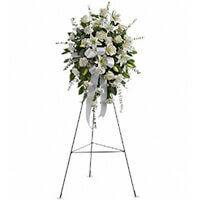 To send flowers in memory of Lenora Jean Allen, please visit our Heartfelt Sympathies Store. We encourage you to share your most beloved memories of Lenora here, so that the family and other loved ones can always see it. You can upload cherished photographs, or share your favorite stories, and can even comment on those shared by others. Sharon Mixon and Ed, Judy, Jim and Barb Hinds sent flowers to the family of Lenora Jean Allen. Though words, however gentle, cannot take your pain away, our love and prayers are always with the family. Sharon Mixon and Ed, Judy, Jim and Barb Hinds purchased the Sentiments of Serenity Spray for the family of Lenora Allen. We are so very sorry for your loss. Please find comfort in God's sure promise of a resurrection as set forth in the Bible (Acts 24:15, John 5:28, 29). Those who are raised to life on a restored paradise earth will have the prospect of never again being subjected to misery, sickness, and death (Revelation 21;4). These and other comforting Bible verses and thoughts can be found at jw.org.